Firstly, I would like to apologise for the lack of posts! I launched my blog, then we got super slammed both at the studio, and preparing to go to Europe! Richards mum is playing in the world tennis masters champs in Helsinki, and we just arrived there today after traveling via Denmark and Sweden. We visited family friends, ate at the best restaurant I have been to in a long time, bought an insane amount of ceramics in Copenhagen, and experienced our first Swedish Midsummer. It has been the best week in a very, very long time. Feeling very lucky to have amazing friends in exciting places! A while back, I got super into smoothies. 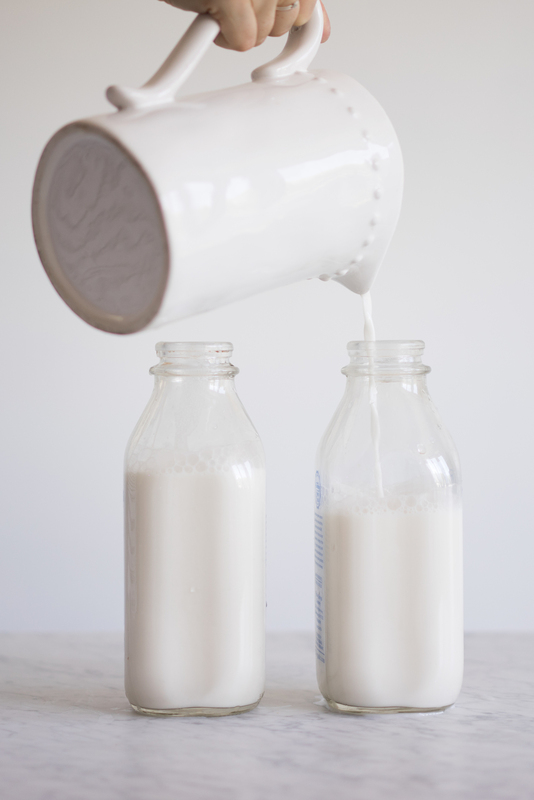 I used to use bought almond milk, until I realised how easy it is to make your own! Its considerably cheaper, you know exactly what went into it, and you can flavour it with anything that you like. You can also decide exactly how much you are going to make, so you aren't left with an entire bottle of milk after using one cup in a recipe. Now I usually have a bottle of almond milk in the fridge, and pop it into baking, smoothie bowls, and a whole host of other things. I like to use a nut milk bag (made of super fine mesh) to strain my almond milk, but you can do it just as easily using cheese cloth over a sieve. I like to pop the pulp in a ziploc bag and throw it into the freezer, and add it to brownies and other baking. If you are feeling super adventurous you can dry it to use as almond meal. The Almond milk keeps for 3-4 days in the fridge. I like to keep mine in glass milk bottles, or a mason jar works just as well. It will separate slightly in the fridge, but a quick shake will fix this. I prefer my nut milk to be a bit more watery than other recipes on the internet - this is a similar consistency to the almond milk that you would buy from the supermarket. If you would like it to be a little thicker and more creamy, reduce the amount of water. One more quick note on soaking - Ideally you soak the almonds for 5-8 hours in cold water, but if you forget, or need the milk immediately, 10 minutes in boiling water will do the trick. Soak the almonds in cold water for 5-8 hours, or in boiling water for 10-15 minutes if you are pressed for time. Turn the blender on high, and blend for approximately five minutes, or until the almonds are well incorporated into the water. Pour contents of the blender into a nut milk bag over a bowl, or into a sieve lined with cheesecloth, placed over a bowl. Drain milk from pulp, squeezing with hands or the back of a spoon to extract as much as possible. Top up with remaining water. Pour into bottles and seal tightly.